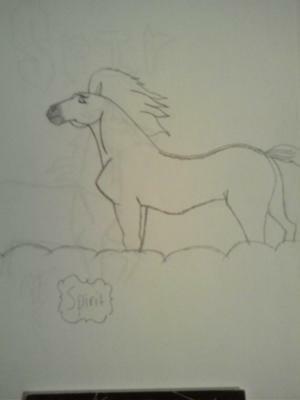 the reason this one is not as good as my others is cuz this is a cartoon horse! spirit from the movie spirit! I agree that movie is really good and so is your drawing. it does look like spirit. i reeeeeaaaaaalllllyyyyy love the movie spirit. it looks just the same as the real Spirit on the movie. WELL DONE! it's okay but it's chest and stomach are too pointy. It is a very good drawing,I could never draw that well..